Use frequently to avoid heavy build-up on iron. 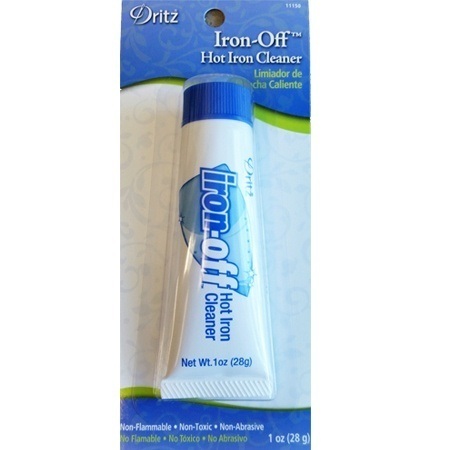 Iron-Off™ will not remove discoloration in metal finish. 1.Empty water from iron and set on "Cotton." Do not use on cold iron. 2.Squeeze about 2 in (5.08 cm) of Iron-Off™ onto thick folded cloth. 3.Rub hot iron over cloth in circular motion. If build-up is heavy, repeat application. Any smoke is normal and part of the cleaning process. 4.After cleaning, thoroughly wipe iron with clean, thickly folded cloth. Be sure all Iron-Off™ is removed from steam vents and around edges of sole plate before using iron. TIPS: Use in a well-ventilated area. Cotton swabs can be used with cleaner to clean steam vents. Spots from cleaner can be washed out or removed with spot cleaner. CAUTION: Hot iron may cause burns. Do not touch hot iron. Keep out of reach of children and pets.